minecraft games | Surviving Minecraft, Minecraft Adventures! This minecraft 1.5 compatible survival map is a must play for anyone who doesn’t care much for squid. Or who enjoys combat based minecraft play. Or who is competitive and enjoys playing to be at the top of the leaderboard. Whatever your particular bipedal ape wiring wants you to do, this map will facilitate the process in some way. The game is simple. Plunge into a tank full of squid and hack and slash until you find yourself on the verge of death. Then stop. It’s a little like shooting fish in a barrel, but slightly less honorable. Download Sky Army Squid Minecraft Minigame! This entry was posted in Minecraft World Save Files and tagged minecraft games, minecraft mini game on March 26, 2013 by Hope. Watch minecraft being played on a TI-84 Graphing Calculator. The talented creator managed to program his calculator to randomly generate terrain that can be mined and built on. It’s not strictly minecraft, but it is the essence of minecraft, and surely that’s enough. This entry was posted in Miscellaneous and tagged minecraft calculator, minecraft games, minecraft on a calculator on February 8, 2013 by Hope. Are you ready for fun and games? Roller coaster and rides? Then you need to download Theme Block, a minecraft theme park with more fun than you can shake a stick at. This map is good for single players, or up to three players if you opt for the multiplayer option. Theme Block is a map containing several rollecoasters, some small and compact, others big and fast. There’s an archery competition, a maze, and even an ice curling competition. And that’s not all! 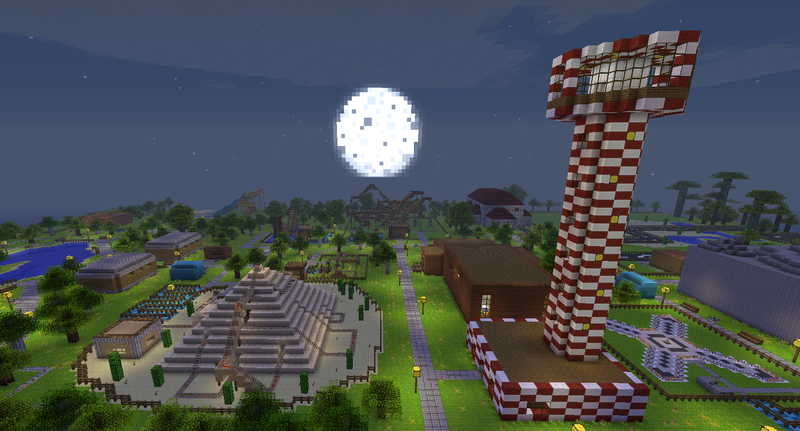 Click here to read more and download Theme Block, Minecraft Theme Park Map! This entry was posted in Multiplayer and tagged minecraft game download, minecraft games, minecraft mini games, minecraft rollercoaster, minecraft theme park, minecraft world download on November 28, 2012 by Hope.